You are here: Home / Advice and Information / Will CPVC plastic fire sprinkler pipes melt in a fire? Will CPVC plastic fire sprinkler pipes melt in a fire? ‘All plastic melts in fire’ is one of the most common myths in the fire protection industry. CPVC (chlorinated polyvinyl chloride) may be a type of plastic, but it’s not true that it will melt and fail in a fire. Its is a common misconception that all plastics have the same characteristics with respect to melting and burning. CPVC is a special compound made by reacting additional chlorine with polyvinyl chloride (PVC) polymer. PVC contains approximately 57 per cent total chlorine, CPVC has approximately 67 per cent. The additional chlorine gives the material a unique performance against direct flame. What is CPVC used for? CPVC has been used in the manufacture of fire sprinkler systems since the 1980s. BlazeMaster® CPVC piping has gained a reputation as the best listed and tested non-metallic component suitable for fire sprinkler systems. CPVC has no reaction to a wide range of aggressive chemicals, it doesn’t support combustion, and is rated as self-extinguishing. The Underwriters Laboratories (UL), an essential guideline within the industry to test and certify fire protection products, conducted a study to test CPVC’s reaction to fire. BlazeMaster® CPVC piping was subjected to fire reaching a peak temperature of ~427°C. During the burning test, the CPVC piping formed a charred layer on the outside of the pipe, which worked as a barrier and reduced heat conduction. This enabled water to keep flowing through the pipe to fight off the source of the fire. CPVC has an LOI (Limiting Oxygen Index) of 60. This means that it requires an atmosphere containing 60 per cent oxygen to sustain a flame. The earth’s atmosphere contains 21 per cent oxygen, so CPVC stops burning as soon as the flame is removed. When it comes to fire resistance, BlazeMaster® CPVC piping has achieved the best possible rating that a non-metal material can get, with low flammability, low smoke development and zero burning droplets. 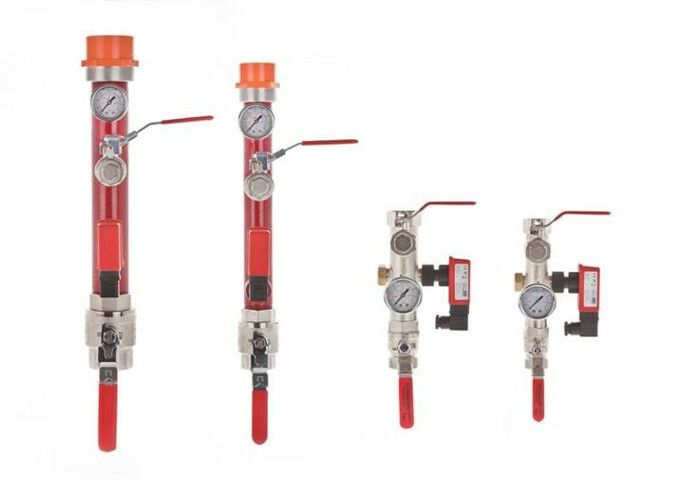 CPVC fire sprinkler systems are known for being light weight and thus have a reputation for easy handling and fast installation. CPVC sprinkler systems cause much less disruption to tenants when being installed, unlike steel and copper pipes which need to be cut by electrical saw and welded on site. This causes excessive noise and leads to an increase in potential hazards. CVPC fire sprinkler pipes are manually cut and solvent-cemented to fittings, so there is no noise from electrical saws and no fire risks from welding. At Applications Engineering we fit CPVC couplings to our fire sprinkler valve sets when requested. Check out the picture above – the CPVC couplings are the orange fittings you can see on the two left images. We can also fit them to the smaller versions as well. Installers then ‘glue-fit’ the CPVC piping into the ends of our coupling. CPVC fire sprinkler systems can contain and even extinguish a fire in less time than it may take for the fire brigade to attend the incident. Fire sprinkler systems using tested and listed CPVC sprinkler pipe have been designed as a life safety system for use in buildings such as hotels, office areas, care homes, hospitals, dormitories, schools, and residential homes. CPVC plastic fire sprinkler pipes will definitely not melt in a fire.